Materiality is important, especially when it applies to lighting. As trends change and tastes develop over time, it’s important to choose timeless lighting that fits your space. Above all, we recommend light fixtures with long lifespans, made of high-quality materials. 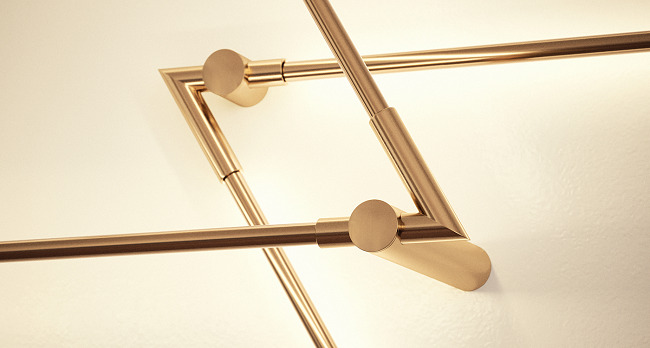 Known for its longevity and durable sustainability, brass has become a top material used in contemporary lighting design in 2019. Brass has actually been at the top of this list for a few years now, but in 2019, new brass finishes are rising in popularity. Brass requires minimal upkeep and cleaning needs, with environmentally friendly recyclability. Juniper Lighting's thin system is known for it’s minimal, yet luxurious brass tubing in various finishes. Aluminum is best used for outdoor lighting and high-output fixtures, which is why this material made our top 5 list of contemporary lighting materials for 2019. As outdoor lighting becomes more curated and developed in the high-end design world, like Juniper Lighting's Rail Outdoor Lighting System, aluminum’s demand continues to rise. Aluminum can be anodized for outdoor durability and waterproofing. Aluminum is also a fantastic heat absorber for high-output light fixtures, like the Metropolis Collection. Naturally drawing heat out of the core of the fixture, aluminum serves as the best vehicle in keeping fixtures at manageable temperatures. As one of this list’s most wide-ranging and versatile materials, using fabric with lighting is becoming undeniably popular. As markets begin integrating sound-proofing capabilities with lighting, fabric naturally serves as the variable in color palette. By utilizing high textures, and bright colors and patterns, fabric can be a playful solution to designs. Acrylic sometimes gets a bad wrap as a cheap material, however it’s important to note there is a whole range of quality in acrylic out there. High-quality acrylic, such as the Evonik Satinice Acrylic used to product the Love Me Not Pendant, is used to create porcelain-like finishes, with a much higher flexibility than ceramic material. Acrylic’s durability and lightweight body even tops glass as a diffuser of light. Offering a delicate softness with moldable and durable attributes, frosted acrylic becomes a luxurious material for lighting. Juniper Lighting prides itself on focusing on the details and producing high-quality lighting with only the best materials available. Their contemporary lighting is thoughtfully-designed and precision-machined to satisfy our standards of design. As always, you can contact Le Studio Luminaire's sales team with questions regarding any of our products.